You already know how I love gardening—the great care involved, the beautiful colors, and the satisfaction of watching your work grow and flourish—so I’ve decided to bring you all into my garden and show you a place near and dear to my heart. This potting shed in my garden is where the magic happens, where I’ve happily gotten my hands dirty, and where I’ve made a multitude of memories. Through the gate and down a short path is the focal point of my garden, and it’s both practical and pretty. Tucked beneath a towering oak tree, my rock-walled potting shed is made from leftover stone and assorted old bricks. It is where I plan my garden, start seeds under grow lights, and store all of my terra-cotta pots, trowels, and gardening treasures. I just love some of it’s charming features like the cornflower-blue Dutch door and the ceiling fan to keep me cool when I’m working in the hot Alabama summers. The shed’s muted tones act as a canvas and let the colorful perennials that bloom in the foundation planter really take center stage. Inside, I chose to have exposed beams for a place to hang herbs, hydrangeas, and roses to dry. Wide shelves wrap around the walls for a place to store gardening basics and special items from antiques shops and flea-market jaunts. I think this quote by 20th-century writer Karel Capek describes gardening beautifully. “Let no one think that real gardening is a bucolic and meditative occupation. It is an insatiable passion, like everything else to which a man gives his heart.” This simple square potting shed tucked into my garden is where my passion comes alive and where I get to work alongside Mother Nature to create natural beauty. It is a truly special place, and it has my heart. To see all of the photos and the full article about my garden and many others, pick up the gorgeous special issue of Victoria magazine, Gardens of Bliss. I’d love to hear about your dream garden in the comments below. Do you know the difference between its and it’s?? 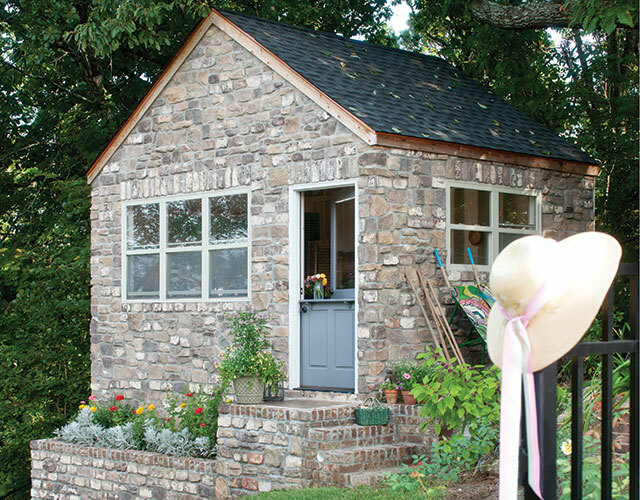 Oh my, your potting shed is absolutely adorable and your garden so lovely! I love your cottage! Wish I had one~! Thank you for sharing. It was a gift Laury. I don’t know. Hardly a “shed”! So inspiring a place certainly deserves it’s own name, but that has to come from you personally. I don’t have a potting shed and like many others are suffering a deep freeze winter. I am so looking forward to seeing my snowdrops peep through the snow under my lounge window. Your quaint little potting shed deserves to be named. It is that handsome! Another passionate gardener! This is my first time reading your blog. North Dakota is cold and often Feb. presents a hint of spring, but not this year. thank you for brightening my day! Your gorgeous gardening shed is just dreamy! How fun to have a place like this to create wonderful memories with all of your grandchildren, family and friends! What a blessing to have such a pretty place that affords you lots of opportunities to enjoy and pursue your love of flowers! I’m a floral designer myself and I’ve longed for a special place like this for years! One day!! I’m believing!! the Great Northwest and so much is in bloom. I can feel your passion in this lovely post, Phyllis. Thank you for sharing this corner of your world with your readers. Lovely post, thank you PHYLLIS ! Buried in snow and polar temps, my thoughts have been on gardening too! You can see pics of my garden at http://www.nellamiller.com. I love Victoria magazine and between issues it is lovely to see the beauty all over again in your blogs. Thank you for sharing your piece of paradise and for the inspiration! Sooooo beautiful. Thank you as always for sharing!!!! We too have been buried under so much white stuff since January! 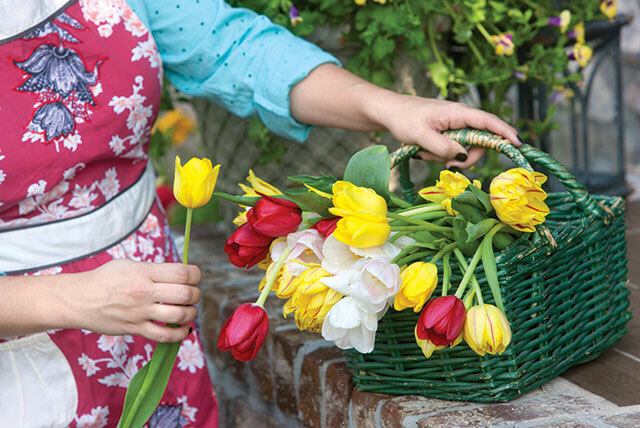 Thank you for showing us your beautiful garden…a breath of much needed spring air. What a beautiful garden! My dream garden would be a walled garden reminiscent of Savannah. It would feature beautiful azaleas, herbs and veges and a charming sitting area. Thank you so much for all your lovely publications.They provide a sanctuary of beauty where we can block out all of the ugliness in the world and just enjoy your vision of what the world can be. After 35 years of working, I retired in July and have dedicated my time now to relishing everything that is fine and lovely. To this end, my husband had a garden installed for my herbs and roses. I agree that your magazines bring beauty and peace and inspiration to a world that NEEDS it! Oh, and please come by and visit me in my dream garden at Dandelion House and meet my flowers and backyard chickens! How fun that would be!!!!! Dear Phyllis, I am so enjoying your lovely blog and the visit to your beautiful potting shed was perfect for this northeastern backyard flower farmer. We’ve been buried in snow for weeks. 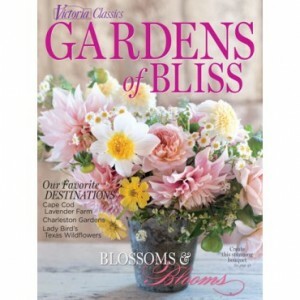 I love Victoria magazine and am looking forward to your special garden issue! 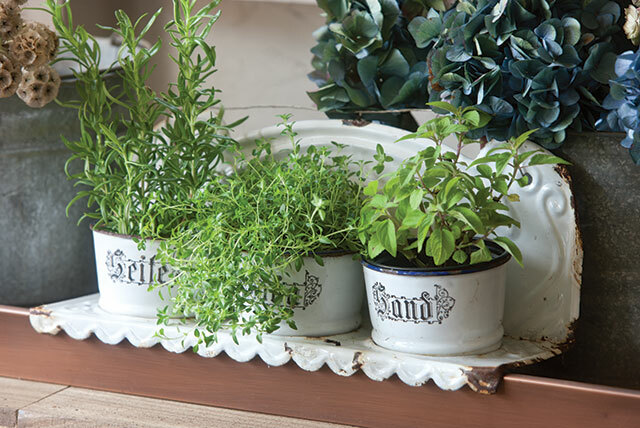 Your potting shed is pure magic! I love your potting shed! It is so cherry! I have what I call my potting shed in my basement which has a huge door leading outside to my sitting area and 2 windows. I think I need more light. I love to be in there working and just sitting there planning. You see it has an old fireplace dating back to early 1800’s, I have a wooden rocker where I sit and plan if not working. Would love to show you a picture. Love and enjoy all your postings!!! Jackie, your “potting place” sounds lovely; enjoy it! So beautiful Phyllis! 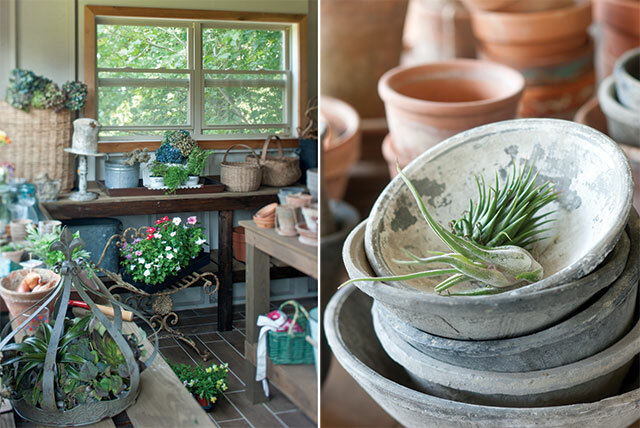 Thanks for giving us a peek into your garden and that fantastic potting shed! Great planning to have rafters to dry hydrangeas and herbs. You are truly a renaissance woman. I can’t wait to hear what you’re doing next! I would like to move into this enchanting little place, how lovely!